and we all enjoy sharing our models with other folks and kids. I have a friend that has been into aviation since he was a kid. His Father owned and flew a Stearman PT-17 when he was a kid. a re-paint of the F.G. Stearman to try to match the one his dad owned and flew. 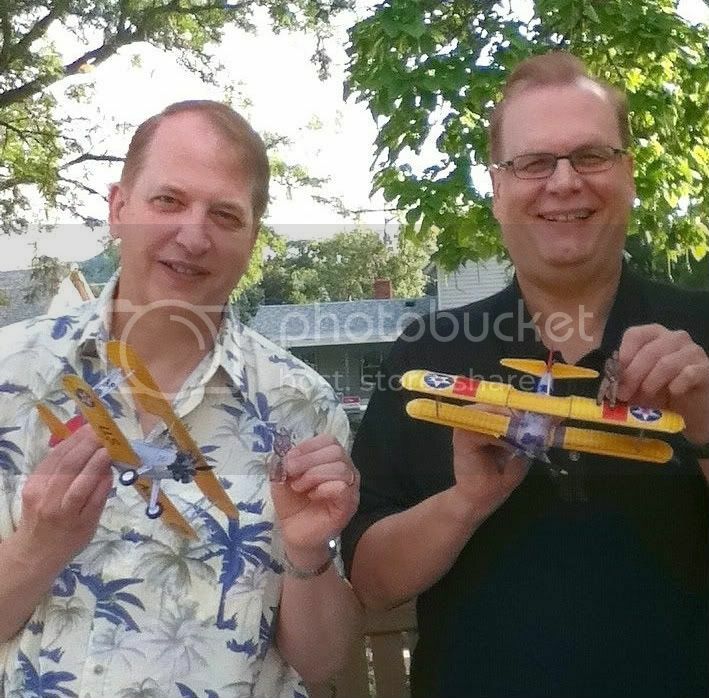 So my friend e-mailed me a couple pictures of his Dad with his Stearman, and I went to work. 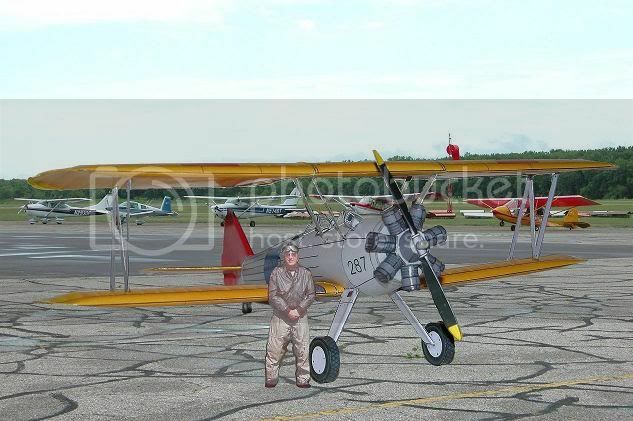 a cutout of him to have with the airplane to match the picture he sent me. When he came to our house to pick up the model it brought a tear to his eye. He liked it so much that he asked me to build another like it for his brother who is comming to visit him from out of state in a couple weeks. I should be able to have it done for him to surprise his brother with. The following three pictures are what I wound up with. The original with his Dad. The model and cutout standing with the model. For all you technical guys,,, NOTE,,, he said I did not need to do the wire rigging as I reinforce the struts with florist wire to make the wings and landing gear extra solid. 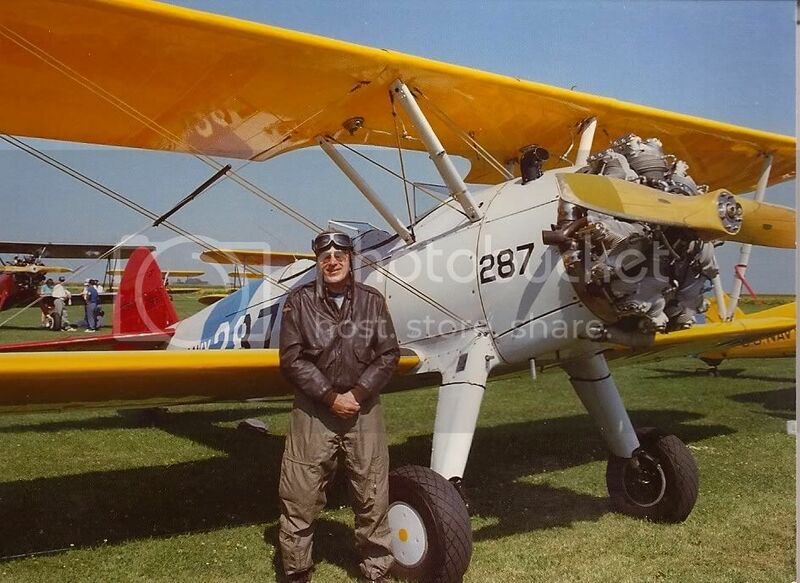 And,,, the yellow tail feathers were OK with him as he said his dad painted the stearman different colors all the time. Thought I would add the final picture. Stearman model I made for him. their thanks for doing this project in their Dad's memory for them. models for folks out there. Anything is possible with paper. Hope you enjoy the picture, my friend is the one on the left. Last edited by musicman on Mon Aug 15, 2011 5:23 pm, edited 1 time in total. Great Job Gary!!!! and what a tribute to a friend & his Father!!!! That is a great tribute piece! I'm sure your friend appreciates it. It's fun to make people happy. Hope his brother likes the one I'm building for him too. This has been a fun project to do. From the picture, to a model, and cutout of his Dad. Now to finish the one for his brother too. Really nice! I love this model. Makes me want to get back to building bi-planes.